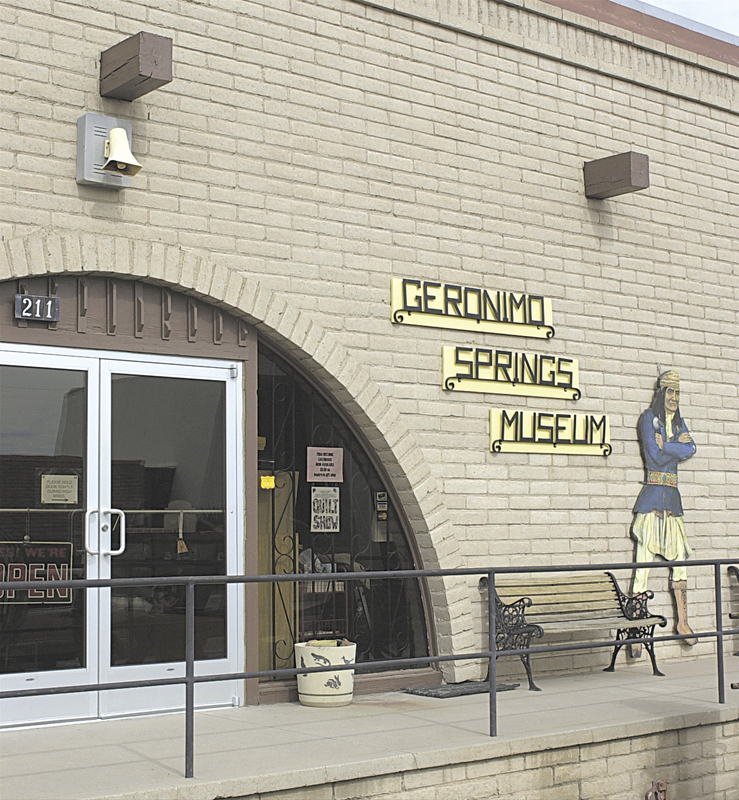 One of the most popular tourist attractions in Sierra County, New Mexico, located in downtown Truth or Consequences, is Geronimo Springs Museum. It hosts thousands of visitors every year from all over the world, bringing attention to the fascinating history of southwestern New Mexico. A community effort begun in 1971 with the local Rotary Club holding the first pancake breakfast earning $300, community support and fundraising efforts reached a total of more than $60,000, enabling the museum to open its doors to the public during the 1972 Fiesta. Since then, it has continued to grow. The vast majority of the items on exhibit were donated by community members and citizens interested in preserving the local history. The mammoth and mastodon skulls in the Fossil and Mineral Room were found here in Sierra County, remnants of the distant past. Geology exhibits of rocks, many from the local area, are also displayed. A life-size statue of Geronimo highlights the Apache room. Also on exhibit are early Apache baskets and history of the Warm Springs Apaches, who once lived in this area and bathed in our wonderful hot mineral waters. The Hispanic Heritage room focuses on displays of the early farming communities that settled in the mid-1880s, in addition to the historic Jornada del Muerto portion of El Camino Real that passes near here. It was the major north-south route from Mexico City to Santa Fe since established by Juan de Onate in 1598 and an integral part of the settlement of the Southwest. The Ranch Rooms depict ranch life during the late 1800s to early 1900s, with many old tools and household items on display. The walls of one room are decorated with many of the brands of Sierra County residents and the chuck box was used by one of the more prominent Sierra County ranches. The Wilson Room has exhibits and photographs from the early founding of Hot Springs and other Sierra County communities, showing what life was like “back then.” Included are the first bank teller’s cage and many old-style business machines. The Pottery Room has a world-class collection of early pottery dating from AD 200 to AD 1540, including much of the Mimbres black-on-white. There is a large collection of arrowheads, effigies, tools and ornaments from the prehistoric people inhabiting the high desert mountains and valleys of southwestern New Mexico. There are also pieces of contemporary pottery on display to show how the traditions have continued. There are two Military Rooms encompassing military history from the 1850s to the present. In one room, displays of artifacts from early forts pay tribute to the importance of the military presence in the settlement of the area. In another room, local area veterans are honored for their contributions to making this nation what it is today. Their stories are told as individuals who endured what had to be done to serve their fellow man. The Community Room was funded through the generosity of the Hot Springs Women’s Club, an organization of ladies who felt that such a room was needed for meetings and gatherings in the town. They provided funds for the remodeling of the room and furnishing of the kitchen. The room is rented out for parties, showers, meetings and other functions to help offset the expense of museum operations. Art displays of work by local and regional artists highlight the gallery walls. The displays change monthly and may be either works for sale or collections for exhibit only. In 1977, the Ralph Edwards Wing was added. The Ralph Edwards Room holds memorabilia of the early Fiesta years, mementos of Edwards early life and the story of the name change. Continuously playing videos alternate between excerpts of early Truth or Consequences television shows and Ralph Edwards narrating memories of the early years. Several 1950s Fiesta dresses are on display, as well as pictures of all the Fiesta Queens. Four huge paintings by Delmas Howe highlight the Heritage Room. They depict the four cultures that contributed to the history and settlement of the Southwest: Apache, Spaniard, Mexican and Cowboy. There are four sculptured bronzes by Hivana Leyendecker on the same subject matter. Also in the room are the “Turf Club” bar, Eugene Rhodes display, Old Time Fiddlers Hall of Fame, and a collection of hand carved wood statues paying tribute to the early explorers and Native American culture. Fiesta 2002 brought the dedication of the Windmill Patio and Geronimo Trail Interpretive and Visitor Center. These were added through a grant obtained by the Geronimo Trail Scenic Byway, one of 27 scenic byways in New Mexico. The Interpretive Center was another historic building that was renovated, and contains displays on the history and attractions of all the communities in Sierra County, as well as tourist information from the local area and around the state. The Windmill Patio has a full-sized ranch windmill, dedicated to the memory of Bill Johnson, in a rural setting where visitors can sit and enjoy the patio. The Gift Shop has a wide assortment of books on Sierra County and southwestern New Mexico, USGS topographical maps, unique gift ideas and collectible souvenirs. The volunteers and staff are always ready to assist shoppers and information seekers. Items on display in front of the museum include a freight wagon that hauled freight from Engle to the mining towns, the pump from Cutter that provided water for the steam locomotives, and one of the original turbine runners from the Elephant Butte Dam hydroelectric plant. Geronimo Springs Museum houses the history of Sierra County in more than just artifacts. There is a reference library of documents, books and photographs on the local area that is frequently used by researchers, authors, historians, students and the general public. There is an ever-growing collection of audio and video oral history interviews. This museum is an evolving establishment that is constantly acquiring additional items of significance to the history of the area, expanding its displays and meeting the needs of the visitors who enjoy it.